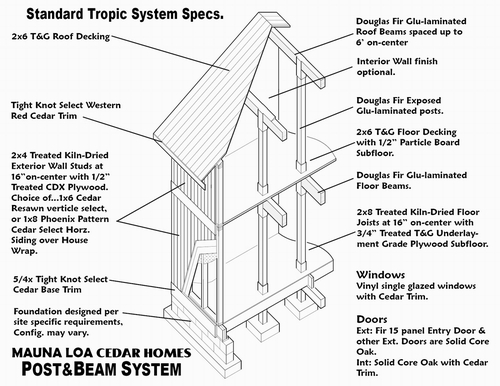 At Mauna Loa Cedar Homes, you not only get to design your own custom home, you also get to choose the building system. We offer 3 distinctively different building systems to meet your building criteria and aesthetic appeal. MLCH offers these systems in a "Tropic" spec. configuration specifically designed for Hawaii. 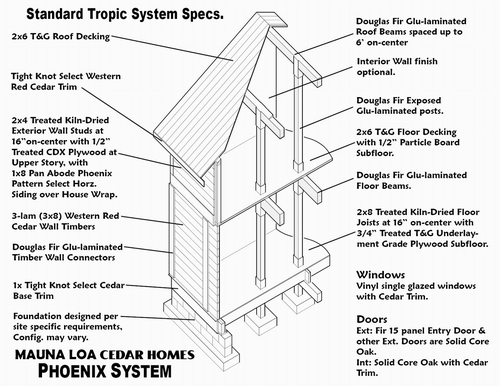 Phoenix Timber Building System - Walls of rectangular profiled laminated Western Red Cedar timbers engineered to withstand hurricane strength winds. Joined by vertical Douglas-Fir Phoenix Columns, The Phoenix System is the strongest wood building system in the world, and perhaps the most beautiful. 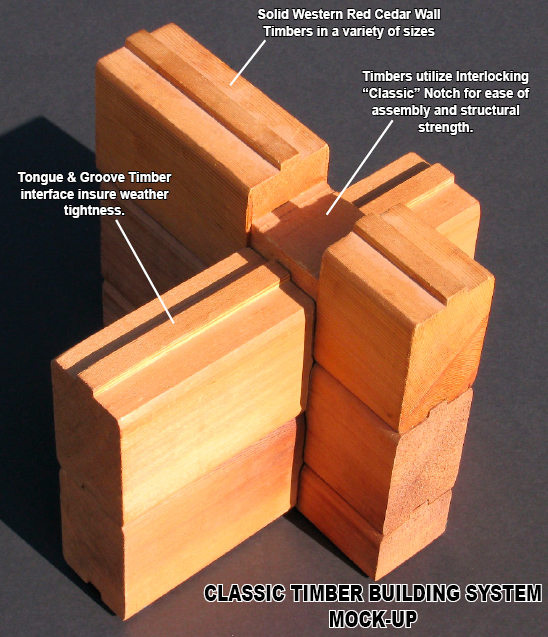 Classic Timber Building System - Our original interlocking Timber Wall building system. Designed by a Danish cabinet maker, who wanted to create a home that was as finely put together as the exquisite cabinets he created. The Classic Timber Building System featuring air-dried solid-sawn timbers of Western Red Cedar that interlock to create a timeless look of beauty. 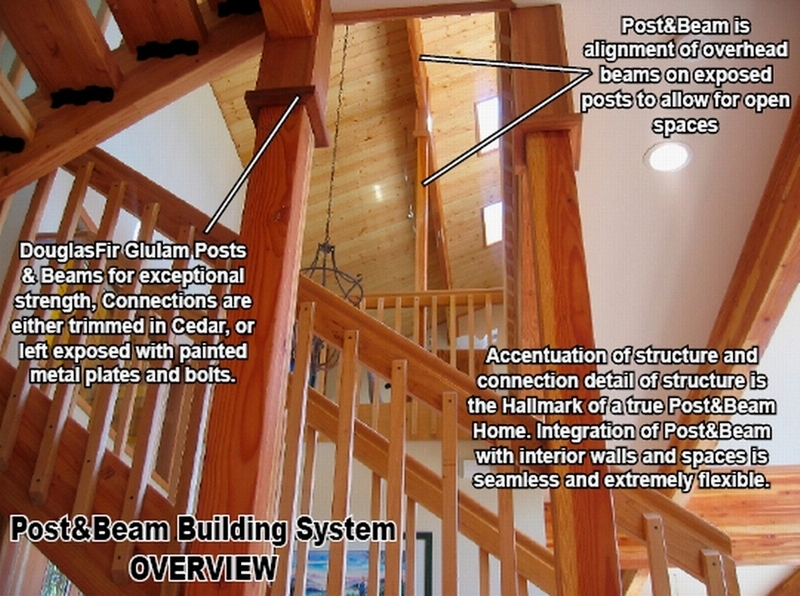 Post&Beam Building System - The perfect combination of luxury and affordability, The Post&Beam building system is characterized by expansive open designs, cathedral open beam ceilings, accentuation of the Heavy Timber structural elements, and Western Red Cedar trim and siding. 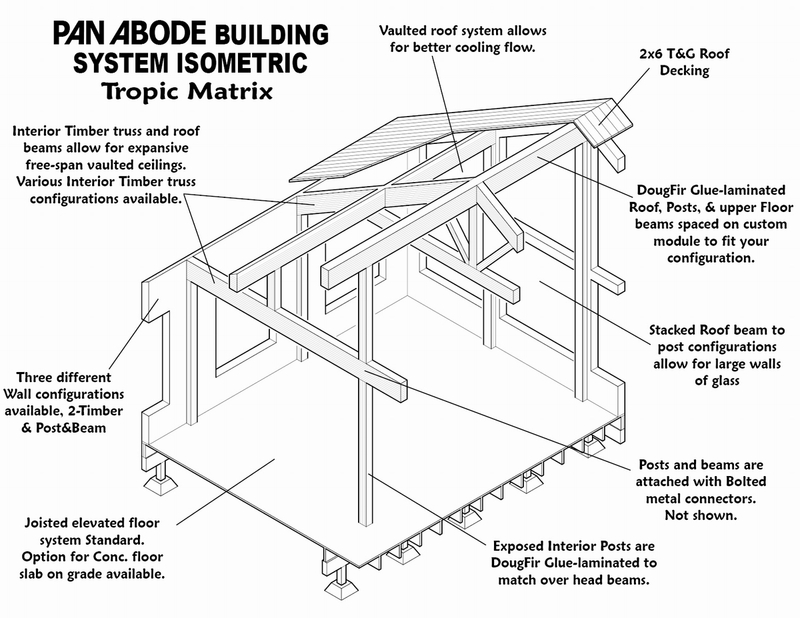 All our building systems are based on a classic Post and Beam structural matrix that stacks the roof structure over the floor structure in a way to isolate the building weight to points that are controlled easily and cost effective to build. When building over lava or dynamic terrain, the weight of the structure is bore by isolated conc. pads making building easy and with minimal disturbance to the surrounding site. Building plans, yours or ours? 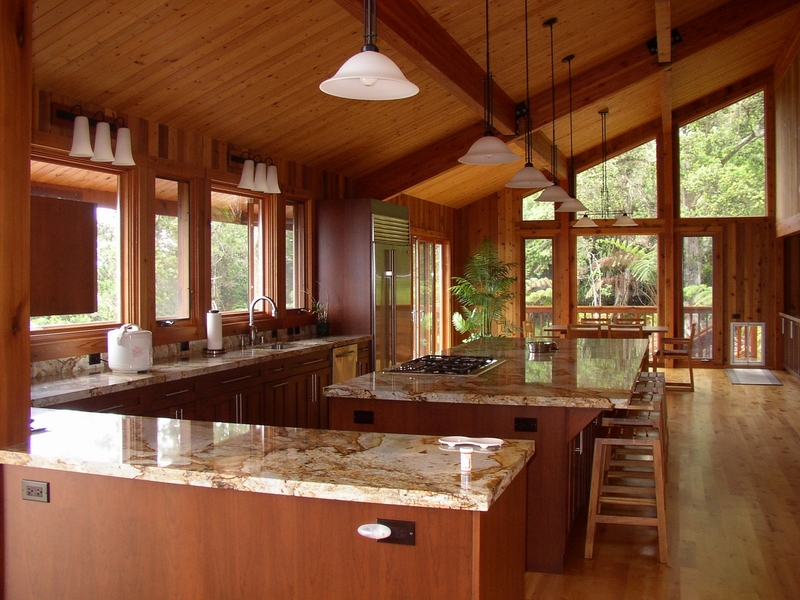 Pan Abode Cedar Homes has been giving away award winning Custom Design with our building packages for years. Choose one of our plans and feel free to modify it, or bring in your own plan. With our "Free Custom Home Design Consultation", we will give expert design assistance and supply you with an accurate FREE pricing estimate. Work directly with a designer to get the home you want. Contact us to initiate the process. A solid wood home, with a refined modern appeal! The contemporary look of the Phoenix Timber Building System integrates well in any landscape or neighborhood. For those who desire the allure of a solid wood home, with a refined modern appeal! The Phoenix Timber building system is an exceptionally strong, easy to assemble solid timber building system utilizing horizontally stacked kiln-dried laminated Western Red Cedar timbers made of 3-1x laminations. The result is a 3-lam (3x8) Cedar Timber engineered to create a solid timber wall able to withstand earthquakes and hurricane-strength winds. The Phoenix Timber wall segments are adjoined together by Douglas Fir vertical columns. Why are laminated timbers better? The dimensional stability of engineered laminated timbers are far superior to solid timbers in that the reversed orientation of wood grain in the laminated timbers resist the woods internal stress that causes twisting, cracks, and bowing. Making the resulting timbers at rest and free from internal stress. Western Red Cedar is also a far better insulation performer than most all other woods because of its internal cell structure. 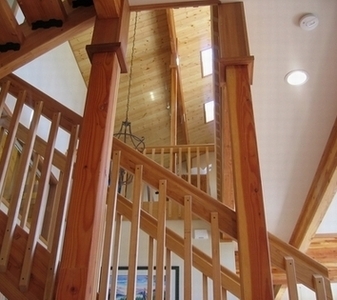 Cedar has a high thermal mass property that actually stores heat and gives it back off later. Conventional insulation does not have this ability. Timber movement is controlled with the Phoenix System. 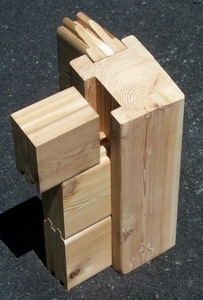 The Phoenix Timber Building System is an advanced corner-post ("Phoenix Column") system that utilizes vertical Douglas Fir dado 'd columns to stabilize the kiln-dried wall timbers from differential settlement which is a big problem with conventional log/timber construction systems. 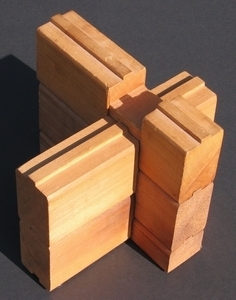 All wood members swell and contract perpendicular to the grain dependent on humidity and temperature. Solid logs move allot more than laminated. Our patented Phoenix Timber Building System Columns minimizes the amount of movement by allowing the timbers to react independently from one another. The Timbers are attached to one another by tongue and groove interface and a low modulus adhesive that acts as a sealer and moves with the logs at any temperature. 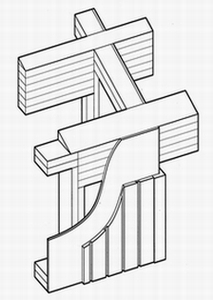 The Vertical Phoenix columns are periodic along any one wall line and depending on structural needs, these columns may be anchored directly to the foundation by a hidden hold-down system. Truly an advanced engineered log building system, easy to construct! Our Original traditional classic notch timber system: Developed by a Danish cabinet-maker over 50 years ago, our Classic Timber Building System uses solid sawn Western Red Cedar Timbers joined in an interlocking fashion referred to as the "Classic Notch", to join the timbers into a solid wall system with a rustic appeal. 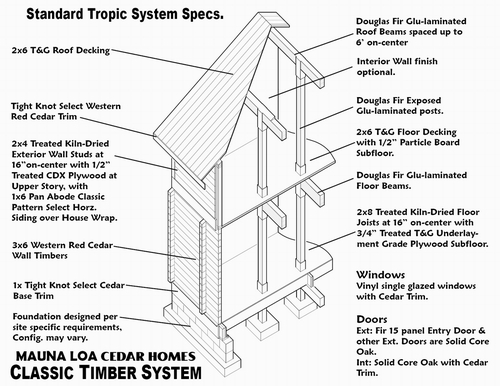 The Classic Timber Building System is our original system that launched Pan Abode Cedar Homes as a recognized leader in fine machined Cedar Homes. Thousands of Classic Timber buildings stand on the planet as a testament to the lasting durability of this traditional horizontal stack application. Undoubtedly you have stayed in a Classic Timber home and have experienced the natural clean atmosphere exuded by the Classic Timber walls. 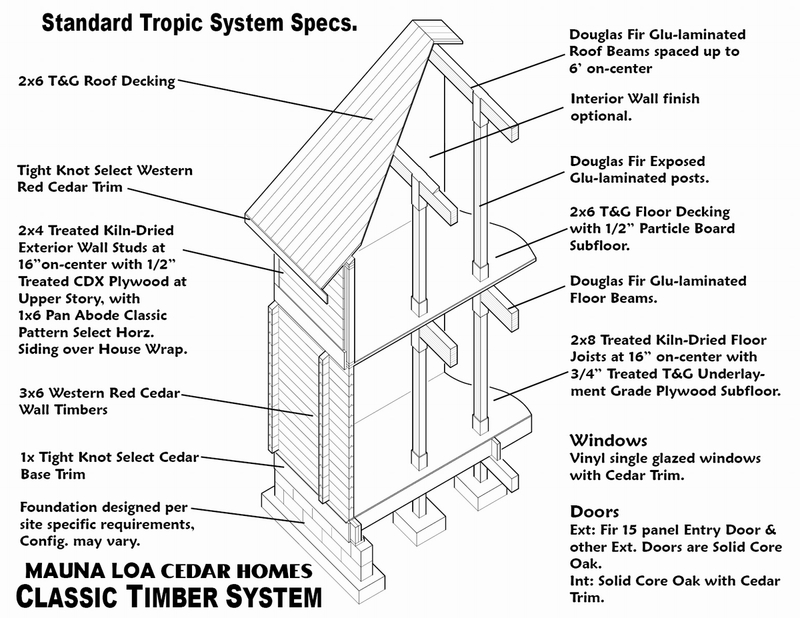 The exterior and load bearing walls are solid, are 3x6 air-dried timbers. Interior non load bearing walls are conventionally constructed. 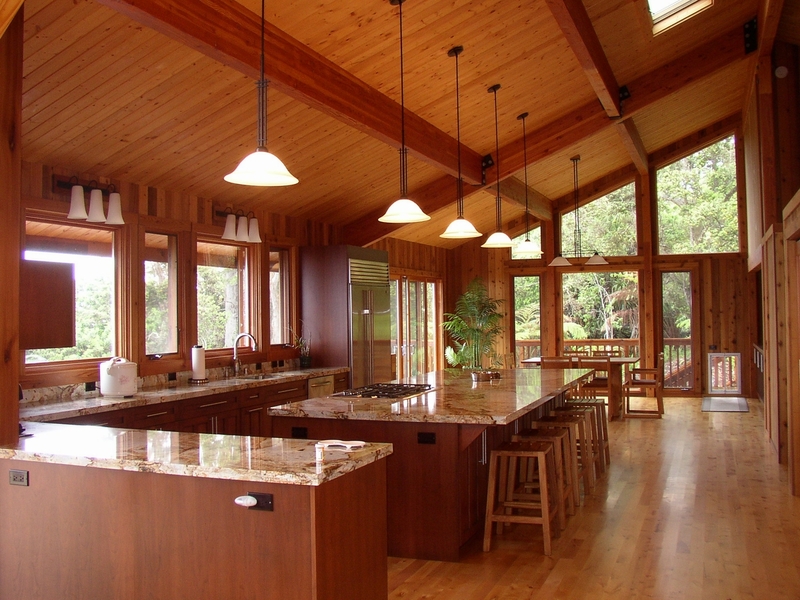 The incomparably inviting smell of Western Red Cedar wall timbers, coupled with Classic's ageless beauty, remarkable insulating qualities, natural resistance to decay and insects, and exceptional durability create an authentic Cedar Home that is truly delightful. 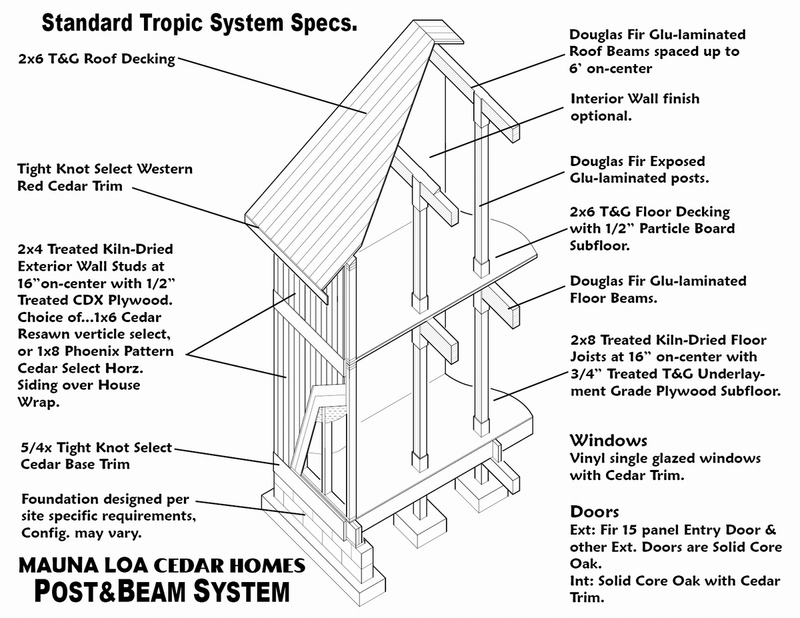 Mauna Loa Cedar Homes POST&BEAM is the True Post & Beam building system known for expansive open spaces and accentuation of structural detail, don't be fooled by imitations. A rich combination of Western Red Cedar ext. siding and trim, with full cathedral exposed Douglas Fir Beam ceilings and contemporary walls of glass that bring the outside in and creates an impressive open design. The structural strength of our Post&Beam home comes from sturdy Douglas Fir glu-laminated posts positioned under the overhead Douglas Fir glu-laminated roof beams spanning the structure. Pan Abode Cedar Homes Post&Beam homes are designed with flexibility in mind. The Post&Beam Building System is ideal for the manipulation of structure to arrive at a custom cedar home by our designers to meet your discerning needs. The Posts and Beams are spaced 6' apart which maximizes the ratio of space to cost and provides optimum design spaces for rooms such as bathrooms and bedrooms as well as spaces for larger doors and windows. Infill is treated 2x4 stud walls. This system allows for expansive living spaces and high ceilings not restricted by traditional framing and load bearing walls. Exterior siding is 1x6 Western Red Cedar. Interior walls are finished with optional cedar paneling, pine paneling, drywall, or any custom material you select. The open beam ceilings are 2x6 Whitewood decking over Douglas Fir glu-laminated roof beam matrix. 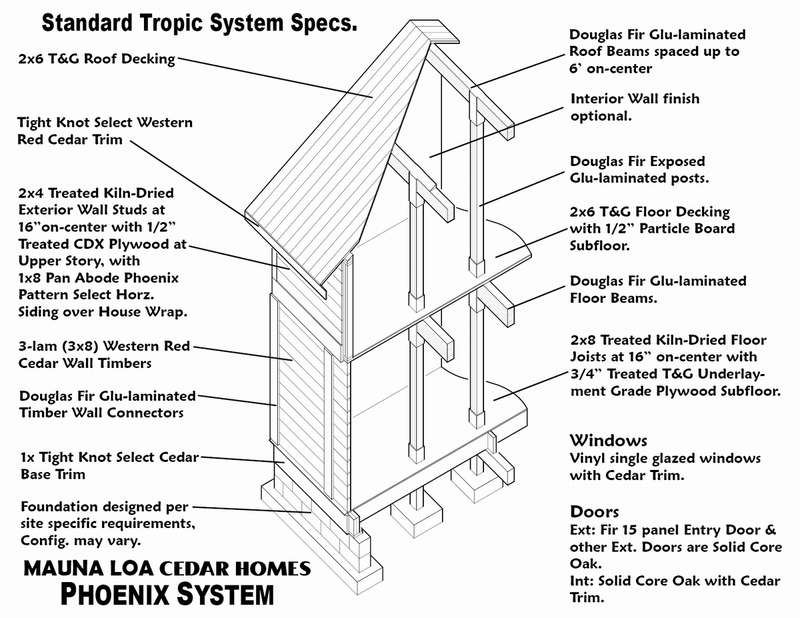 The Mauna Loa Cedar Homes Post & Beam home. A combination of materials and spaces with unlimited possibilities.